"Spain is currently the hottest culinary destination in the world". 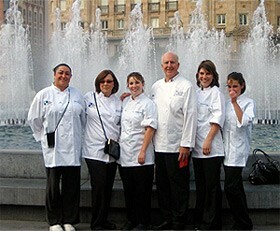 Our former participants describe our programs as "a deep immersion in the Spanish culture and gastronomy". Pork leg and squid terrine, tomato, almond and chili sauce, squid cream and cracklings. Scallops with chorizo, mojo and corn sauce. Aromatic cone of prawns and grilled vegetables with crème fraiche. Ravioli stuffed with extra virgin olive oil mousse, melted parmeggiano reggiano cheese and Iberian ham. Tempura cod with peas and potato. What is the International Culinary Schools Tapas Competition? InternationalEvery year the Town Hall of Valladolid, a city located in the Northwest of Spain, (one hour by train from Madrid) celebrates the annual and unique nationwide tapas competition. This year is the 5th National contest, and over 60 chefs from all around the country will participate in this event. Due to the international interest in this event, the Fundación de la Lengua Española, a non-profit cultural and educational foundation, will organize the first International Tapas Contest for students that represent different culinary schools from various countries. A total number of 7 students will have the opportunity to participate and represent their countries and their schools. This new competition is open to every international culinary school students; it will showcase students' cooking talent on an individual basis. Based upon prior selection through an application format contest, seven students will be judged by a panel of national and international chefs and professionals on this field. This competition gives students and professors the chance to participate in an educational complete program that encourages them to discover and develop their culinary talents. Who can apply to enter the cooking competition? How does the application and competition process work? Each School can be only represented by two students. The student must be enrolled in a culinary class in a school that has received this information. The student must have completed at least one course in the culinary arts program. Students need to be older than 19 years of age and fluent in English. Students submit all required Competition Application documents to your culinary arts teacher by the application deadline. Incomplete applications will not be accepted and are disqualified immediately. 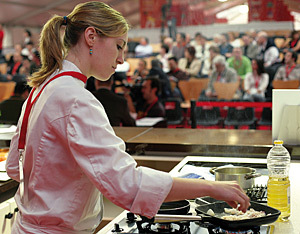 Learn and practice the Preliminary Competition recipes and requirements. Submitting a completed application does not guarantee you will be in the competition. But to be ready, it's important to start learning the recipes and practicing the knife cuts immediately! Every application must be endorsed by one culinary professor of the school. The school must decide which student is representing the school and will be allowed to send only two applications. Applications must be sent by August 1st, following the rules that are specified in the attached application form. A team of professionals from the Fundación de la Lengua Española will select one participant per country. 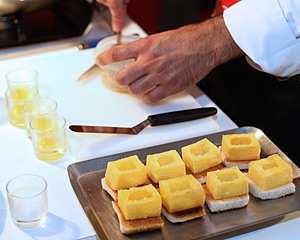 Learn and practice the recipes for the Final Competition. Again, you want to be ready to compete if you make it to the finals. Wait to be notified if you are selected for the Final Competition. You will receive an email letter stating if you have, or have not, been selected to compete. Dead line September 1st. Compete in the Final Competition, if selected. The Fundación de la Lengua Española will give the school a scholarship that will cover all the travel arrangements, airfare and full board for the student and the professor that will participate in the final competition in Valladolid, Spain. The dates for this final competition will be from November 8th to 13th, 2009. Throughout these 5 days, the student and the professor will follow an intense culinary program being able to enjoy the 5th National tapas competition. The jury will consist of a select panel of national and international judges. The evaluation of every entry will be based upon the specifications of the application form. The final prize(s) will be notified to the students selected to the final. What do I need to include in the Competition Application? Photo of the “tapa”:Participants will send only one photo in a jpg document with a minimum size of 640x480 pixels. Ingredients: That will specify all the ingredients used in the tapa and the quantities. Preparation: That will give the guides to create the tapa. Use of a mix between local and Spanish ingredients-15 pts. Value. Normal cost of the ingredients in a tapa must be under 2,50$- 15 pts. By entering the contest, entrants agree to abide by the Contest Rules and the decisions of the Fundación de la Lengua Española judges, which are final. By entering the contest, winners agree to the use of their name and the name of their school, address (city only), comments, voice and images for publicity purposes by the Fundación de la Lengua Española, without further compensation. We will provide your students with a unique and authentic educational experience that goes beyond the classroom. Our experience gives us a wide offer that will fit your school's needs and budget, blending to capture the best of traditional and new cuisine. A qualified team of instructors will give you a daily personal service. Our representatives will share with you not only their gastronomy knowledge but also the culture and history of our country. You have the possibility to complete your educational trip with additional language classes, from basic to advance language skills and language courses for the F&B industry. "Craft a perfectly organized and unforgettable culinary experience"
"Taste the richness of the Spanish cuisine"
The hospitality and tourism industry in Spain has been the main business for the last decades. Learn more throughout different activities like workshops with tourism and hospitality specialist or hotel directors. We ensure an educational curriculum to your students offering a deep immersion in the business. 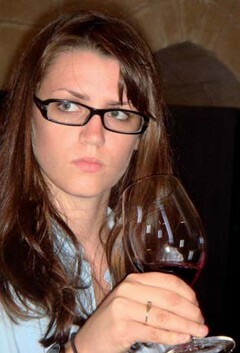 Nowadays our country is one of the largest producers of quality wines in the world. Experience it trough wine tastings, visits to wine producers and different wine region appellations, wine harvest festivals and other oenology activities. Imagine the monks elaborating their wines and you visit a XII century Abbey meanwhile, or think about the different variety of grapes while you have lunch in a XV century cellar. For centuries Castilla y León was the top producer of cereals in Europe. That history left a large number of recipes, traditions and different types of bread and sweets. Most of the times the cloistered monasteries were the ones that preserved such an important legacy. Through our programs baking and pastry students get the opportunity to understand better the significance of the cereals and bread in our culture. We offer cooking demos, visits to museums and monasteries, visits to top producers and local bakeries. An unforgettable experience for baking and pastry professionals and food enthusiats. This restaurant was opened on 1 June 2001. It has dining space for 25, and is located in the old part of Salamanca, opposite the San Esteban Dominican church. The décor is simple and modern, but extremely cosy - a huge window, with light yellow walls and paintings. The restaurant has a Michelin star, and this is where Victor Gutierrez produces his daily fare to his own understanding of professional cuisine. 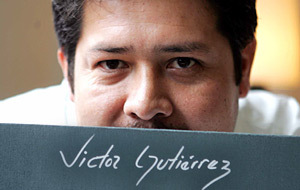 Victor Gutierrez, a Peruvian who took Spanish nationality, is married to Natividad Perez, who runs the dining room. Our chef took his first steps in the world of gastronomy in 1989 in Rosas (Girona), where he worked at a number of restaurants. In 1992 he moved to Salamanca and studied at the Catering College there, subsequently began work in other restaurants, and also went through a number of apprenticeships, including one with Martin Berasategui. 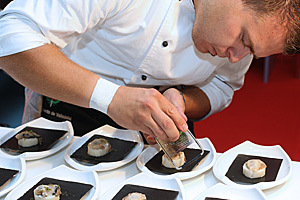 A member of the Community of European chefs, Eurotoques, Gutierrez practises seasonal cooking, attaching great importance to the use of technique, and does not hesitate to implement his techniques with traditional recipes. As a general rule, he buys his raw materials himself on a daily basis from local markets, but does not neglect products from other regions. 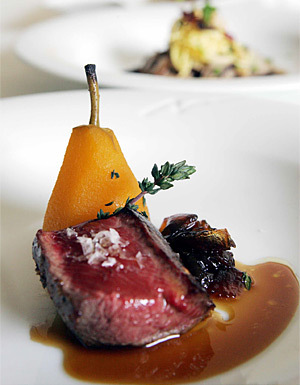 Some of his most inviting meals are the citrus speciality, deer with pear and saffron, or marinated red tuna with soya. Victor daily gastronomic offerings have brought a breath of freshness and modernity to local cuisine. Streaky and roasted Iberian bacon 2.20 lb. Place it on the plate and make vinaigrette with the olive oil and vinegar. We will place on the top the ibérico ham rashers and the grilled shrimp tails. We will finish adding some scallion. Ramiro´s Restaurant, located in the Science Museum in Valladolid, offers a high-quality cuisine, based on traditional products and dishes of Castile and Leon, while combining them with products and techniques from other cultures. This is the essential element of its cuisine. 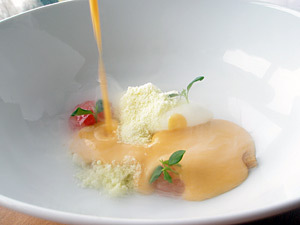 For the elaboration of dishes, the basic criterion is the use of ingredients and techniques that substantially do not modify the flavour of the main raw material. The goal is to look for the perfect flavour and aroma harmony, so that the palate can feel them as they are in their natural basis. 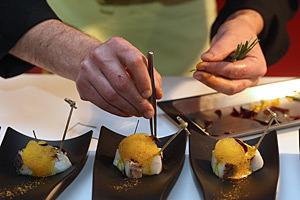 The use of the most modern techniques and tools, without forgetting about the traditional ones when the culinary intuition advices it so. Constant search for new textures, aromas and presentations in its dishes, as well as balance, in order to achieve the most modern and harmonic cuisine. Delicacy and good taste in food presentation. As a reward for this philosophy, Ramiro´s Restaurant was one of the finalists in the Culinary Competition Madrid Fusión for the Revelation Restaurant Prize 2006. 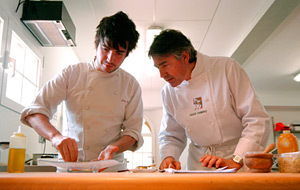 At the end of 2007, the restaurant obtained one star by the prestigious Michelin Guide and a sun by the Campsa Guide. These rewards indicate the great work carried out by Ramiro´s Restaurant, which has also been the motivation to continue working in the same way as it started. Decoration: red pepper, green pepper, tomato, croutons, pine nuts, pine-tree leaves, etc. Clean and cut the squash into pieces before putting it to boil. Once the squash is boiled take it to the mixer and add some of its juice, vinegar, salt, pepper and sugar. Drain and keep the blend at a temperature of 154.4 ºF approximately. To obtain the fresh cheese cream, stir milk and fresh cheese. Next, prepare a quenelle. To create snow based on olive oil, use a chocolate gun or a spray gun in liquid nitrogen. Olive oil snow is natural olive oil (not fried or treated), which is simply frozen when it gets in contact with the liquid nitrogen, acquiring a snow shape. The explanation for this is that this hot dish will make the desired effect on the olive oil. Place the fresh cheese cream on the plate. As decoration, put a dice of red pepper and green pepper, a tomato and Pedrajas pine nuts around the plate. Once the plate is about to be served, put the olive oil snow on the side and next, serve de warm gazpacho over the plate.